I'm back with the last of the Claire Awards - the baby products that we couldn't live without. You can see part one, which features our top picks for sleeping and eating, here. Again, not all of these are the most expensive brands. They're just real tips from a real family about products we used every single day! Obviously, books top the chart when it comes to learning fun for any age. We loved these touch and feel books starting when Claire was about 9 months old (although I will admit some of these titles are better than others). We also love the Eric Carle board books. You would not believe the hours my baby spent laying under this thing! From about 2-7 months, she LOVED this. The sounds, the sights, the songs and lights, the colors and textures she could swat at and try to roll over to reach... it was definitely a favorite! In my mind, this is another must-have toy. When they're younger, they can practice sitting up and playing with the interactive soundboard. When they get older, they can walk behind it. This is Claire's most-used toy right now. The ways that babies play with stacking cups is endless. At first, they like exploring the patterns and colors. Then, they learn fine motor skills as they try to pick up the cups (and inevitably eat them). When they get older, they can use these to practice stacking them and knocking them over, as well as balancing them or hiding smaller ones inside bigger ones. We have these ones from IKEA and love them. They get played with all day every day. Teething toys are a win-win because they ease hurting gums, but they're also fun to play with. When my daughter was about 6 months, she could spend an entire church block eating this thing and twisting it around. We also like Sophie the Giraffe (mentioned here) and Hyland Teething Tablets to ease teething pain! I didn't think I'd ever use a pacifier clip. I mean, babies can't even hold their own head up. How far away can their pacifier really get? Turns out, they can spit it pretty far! We love this cute shop for pacifier clips that are functional but also super cute. I did a very bad thing when I was pregnant. I got the cheapest brand of baby wrap that I could find. I majorly regretted it. The wrap was so heavy and thick and hot that neither me nor my baby liked it very much. Then I borrowed my friend's Solly Baby wrap for a day and it was a million times better! So do yourself a favor and invest in a more expensive one. It's worth the money to make the wrap light, breathable and comfortable. 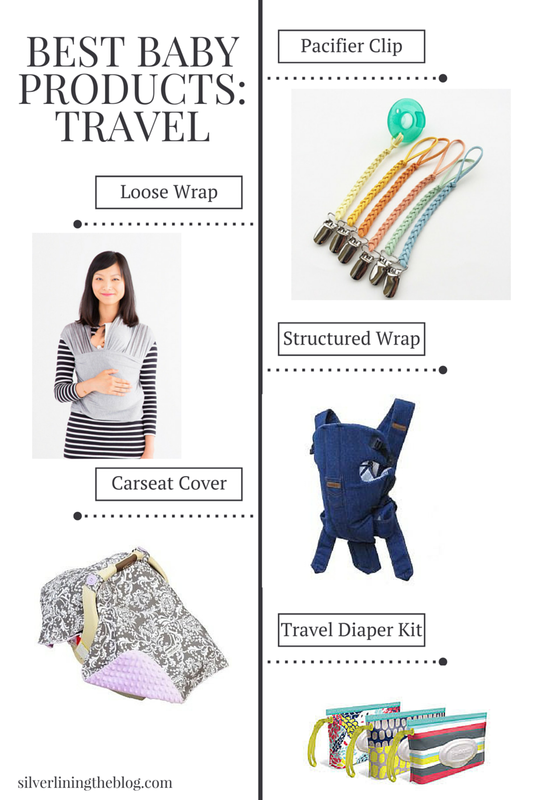 We love the structured wraps when the baby is older, or when you're going on a longer outing such as a long hike. I even used our wrap to go grocery shopping every week. We have an old BabyBjorn that my parents used, but I linked to a newer one I've seen lots of people with lately. We liked our Carseat Canopy way more than we thought. When we were running errands, the cover helped keep away the germy hands of strangers. When we were in the car, we used it to keep the sun out of my daughter's face. We would even cover the car seat when we weren't in the car to keep the buckles from getting too hot and burning her. We love this mini diaper and wipe holder for when we're on the go. It's nice to have something ready so you don't have to dig around for a diaper and wipes when you're out and about and need to do a quick diaper change. I am a huge Carters fan for everyday baby wear! I will admit I'm not a huge fan of clothes with sayings on them (you know, Mommy Loves Me, or World's Cutest Nephew). Carter's does have some clothes like this, but they also have a huge selection of cute clothes with fun prints and a wide range of solid colors. Their onesies and leggings were all my daughter wore for the first few months, because they were just so snuggly and soft. It can be hard to find baby girl clothes that aren't bright pink, or baby boy clothes that aren't covered with dinosaurs. We loved Baby Gap for photoshoots and other occasions in which we wanted something more stylish and neutral. I've found some amazing deals on clearance there over the past year. 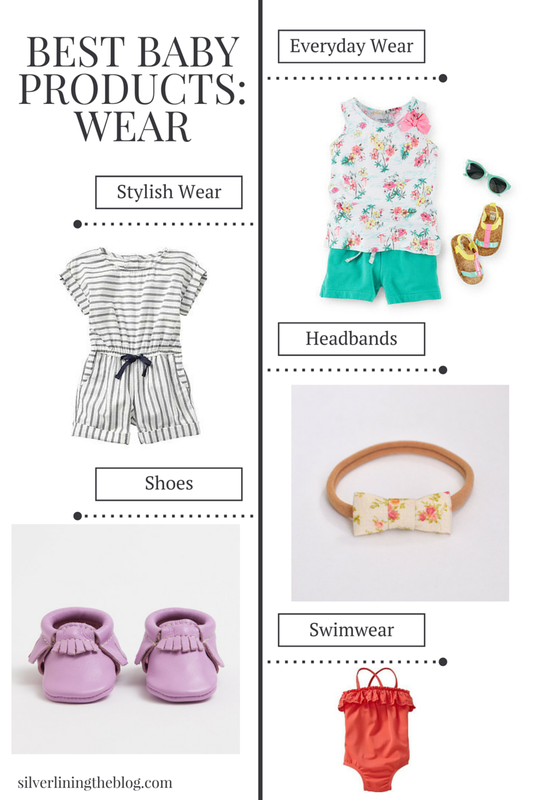 When it comes to baby headbands, we've tried them all! Yasmi and Crew has definitely been a favorite. Their soft bands that expand and shrink to fit any head (pictured above) are amazing. They are so soft and sweet - and one of the few headbands my baby doesn't immediately pull off her head! Is there anything more cute than baby moccasins? We love Freshly Picked moccasins, but now that I'm moving away from Provo and won't be able to go to their warehouse sales, I might have to stick with my other favorite, The Golden Polka Dot. Both these brands have beautiful, high-quality moccs that my baby has loved. So there you have it! The baby products we couldn't live without in Claire's first year. In case you missed it, part one, all about eating and sleeping, is HERE. Any suggestions in these categories? I'm always looking for new products. 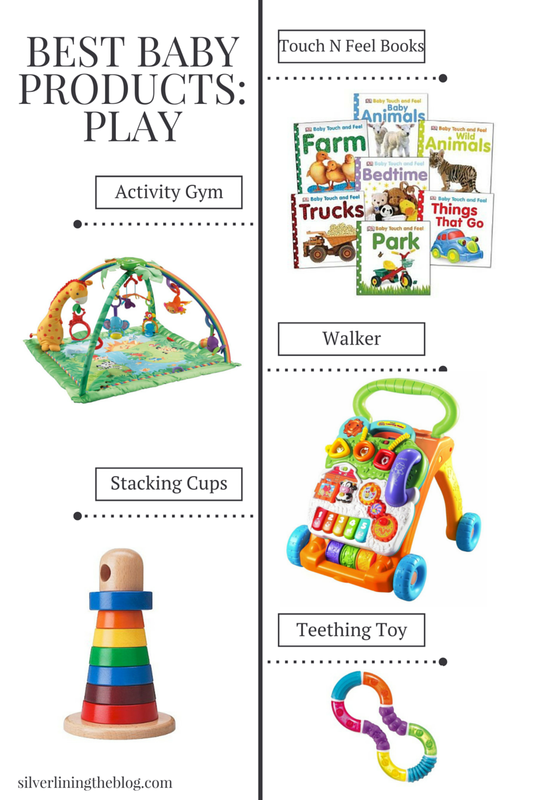 What are your favorite baby brands and items for travel, play, and wear?